Madame Tussauds to unveil five Bollywood icons. NEW YORK: Madame Tussauds New York will unveil five actors from Bollywood from a traveling exhibition, on March 7th. Lifelike wax figures of Shah Rukh Khan and Aishwarya Rai displayed at Madame Tussauds in Washington, DC, in November 2012. Photo by Bala Chandran. 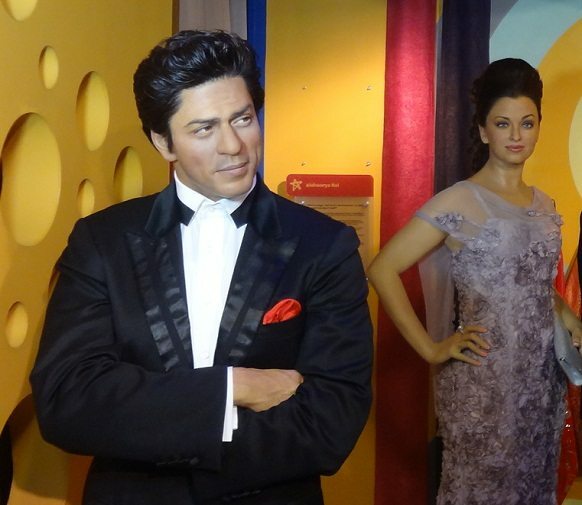 The exhibit features incredibly lifelike wax figures of five Hindi cinema legends: Shah Rukh Khan, one of Bollywood’s most renowned actors and often referred to as “King Khan;” Aishwarya Rai, one of the leading contemporary actresses of Indian cinema who was featured in the blockbuster action thriller Dhoom 2; Hrithik Roshan, acclaimed actor and recipient of numerous Best Actor awards; Kareena Kapoor, who is noted for her performances across a range of film genres, from romantic dramas and comedies to independent films and major Bollywood productions; and Amitabh Bachchan, regarded as one of the greatest and most influential actors in the history of Indian cinema. Each of the wax likenesses was created by Madame Tussauds’ team of artists in London and took approximately four months to complete at a cost of $300,000. The exhibit will be featured as part of Madame Tussauds New York’ “Bollywood Zone” and remain on display through July 12. A group of young dancers from Aatma Performing Arts, who recently took 1st place at the “Dance Pe Chance” competition hosted by the Federation of Indian Associations, will perform at the unveiling of the wax statues. This year, Madame Tussauds New York is celebrating over 10 years as the interactive “must do” attraction in the heart of Times Square, providing guests with unique opportunities to create memories with some of the world’s biggest icons. Recent additions at the museum include: Whitney Houston, Jennifer Aniston, Prince William and Catherine, Duchess of Cambridge, Alicia Keys, Kelly Ripa, Justin Bieber and an interactive Marvel Super Heroes exhibit featuring new wax figures of Captain America and Thor and a 4D film. Madame Tussauds’ interactive exhibits also include the “The Spirit of New York,” which allows guests to interact with some of the most iconic New Yorkers. Madame Tussauds also features world famous athletes, including Carmelo Anthony, Eli Manning, Serena Williams, Derek Jeter and David Wright.